Milano Design Week, the largest and most famous event celebrating design around the world, is the setting for a collaborative, large-scale light installation by LG and Japanese designer Tokujin Yoshioka. 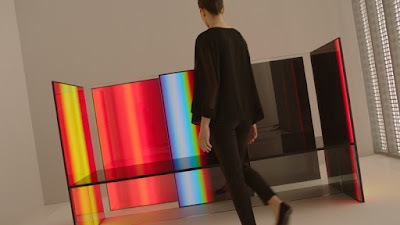 Entitled TOKUJIN YOSHIOKA x LG: S.F_Senses of the Future, the impressive work seeks to illustrate humanity’s relationship with the natural world and to illuminate LG’s human-centric design philosophy. The installation is on exhibit from 4-9 April at Superstudio Piu in Milan. TOKUJIN YOSHIOKA x LG: S.F_Senses of the Future offers visitors a feast for their senses and a taste of what the future holds by combining LG’s cutting-edge technology with Tokujin Yoshioka’s groundbreaking experimental design techniques. One part of the exhibition conveys the story of hope for the future through a commonplace object in people’s lives - the S.F chair. But these are no ordinary chairs, but ones borne of science fiction. A total of seventeen S.F chairs have been artfully ensconced with LG’s advanced organic light-emitting diode (OLED) displays. The chairs are both static and dynamic because of the brilliant flashes emitted from the double-sided panels and portray a meditation on the blindingly fast speed of modern day life. Visitors will be able to sit in the S.F chairs, experiencing at the same time the next-generation of display technology. Another feature of the exhibition, Wall of the Sun, is represented by a 16-meter-wide and 5-meter-tall structure, comprised of nearly 30,000 individual OLED light modules, radically different from traditional bulbs. The wall undulates gently, flashing inviting rays of light and simulating the comfort and warmth felt on bright, sunny days. This extraordinary installation offers a unique glimpse of how human-centric lighting can transform space in the near future.